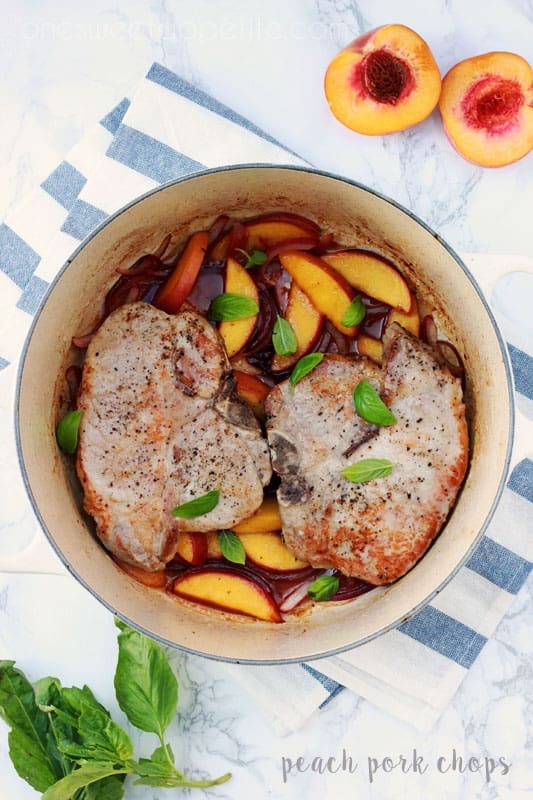 These peach pork chops are the perfect fall dinner! Good news! I found a way to use up some of these delicious in season peaches and not in a dessert! I am all about the quick easy dinners and this one is no exception to that rule. It’s SIMPLE and tastes amazing. Like lick-the-extra-sauce-off-your-plate good. I may have shoved my husband out of the way to get to the last of the sauce in the pan. 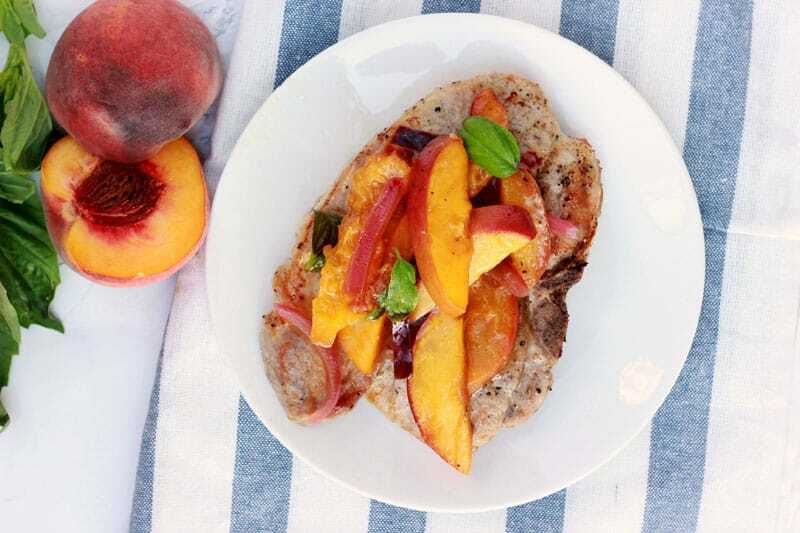 The peaches combined with the balsamic and onions create a blend of flavors that just melts in your mouth. If you are trying to impress someone with a fancy meal… this is it. While it may look (and taste) super complicated it’s actually a fairly simple dish. It took me a whopping 30 minutes to get the put together, cooked, and on the table. That means dinner is ready in under an hour! Woot! I used my Le Creuset French (Dutch) Oven but any cast iron or oven safe skillet will do. I prefer the Creuset because it is SO easy to clean but my husband likes the flavor that comes with a cast iron. Whatever you chose just make sure it’s something you can stick in the oven. Heat the oil in a large dutch oven or cast iron skillet over medium heat. Season the pork with salt and pepper and place in your heated pan. Cook 2 minutes on each side. Remove the pork and place on a plate. In the same skillet combine the peaches, onion, and balsamic. Stir and cook for one minute. Place the pork on top of the peach mixture and put into the oven. Sprinkle with basil and serve immediately. Recipe only slightly adapted from Real Simple. This post contains affiliate links. You need to! 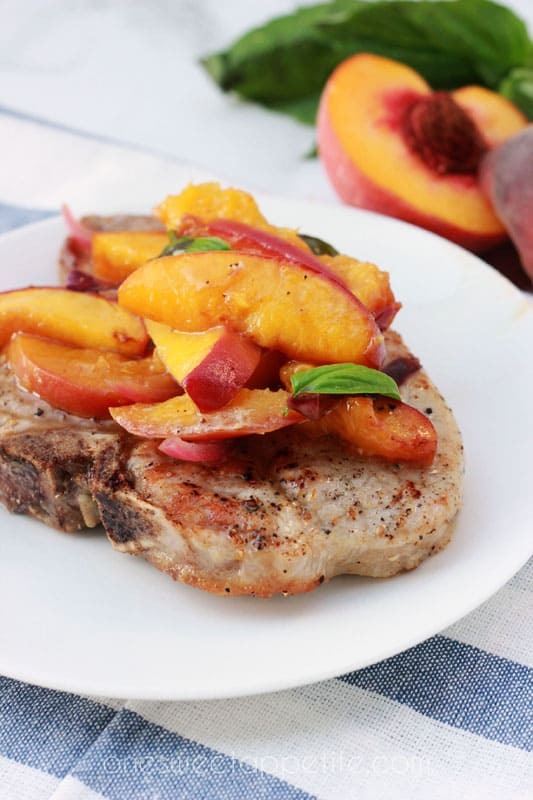 This recipe is so simple and the peaches give the pork such great flavor.